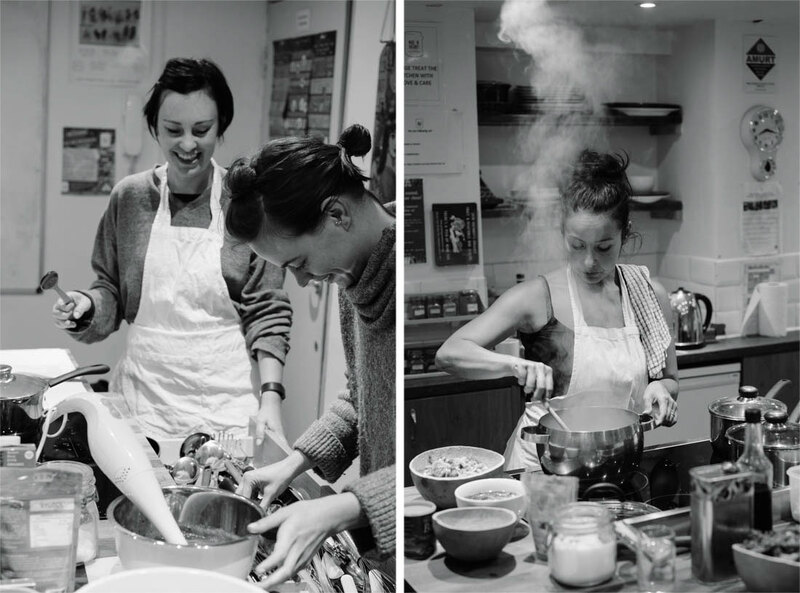 Over the last six weeks I’ve been immersed in a food journey led by macrobiotic chef and counsellor Nicky Clinch. If you follow me on social media you will have heard about this inspiring woman before but for those of you who haven’t this post will give you a pretty good insight to her work. Work which has made me see things a little, read a lot, differently and opened me up in many ways. 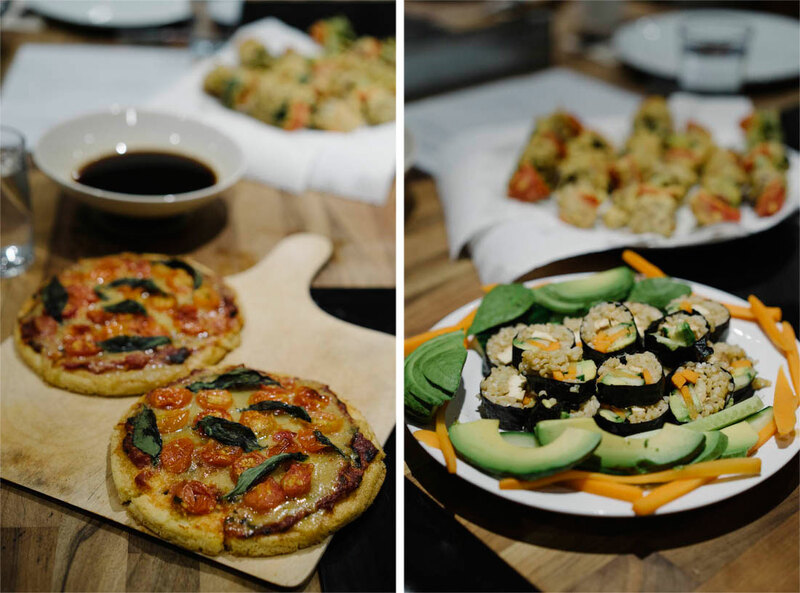 When I started the course I expected to be cooking and learning recipes based on the macrobiotic principles Nicky teach but the course offers more than just cooking and I think the name; ‘Transform your diet, transform your life’ is very suitable as I think my fellow students will agree with. We have been introduced to the energetic properties of food and discussed how they affect us on a daily basis. 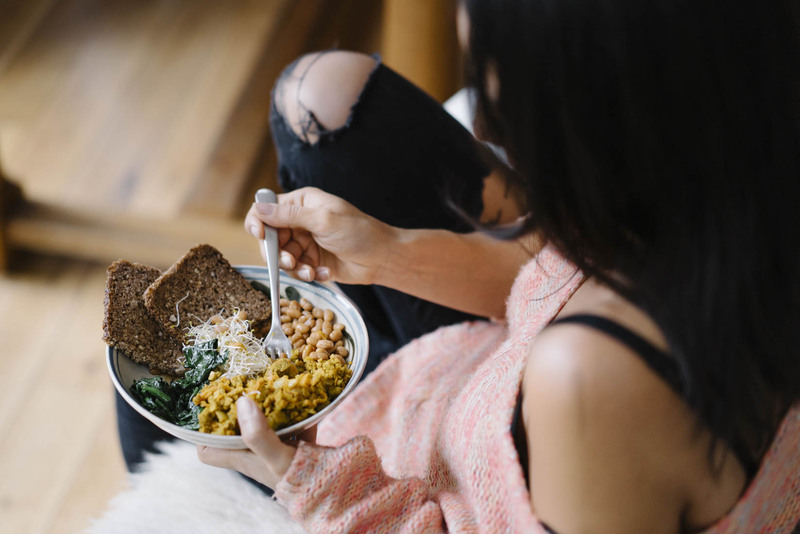 The fact that food does have a large impact on our emotional life might not come as a big surprise to many of you but finding ways to deal with this phenomenon might be harder to tackle. Nicky is of great expertise in this area and gives advice to suit each student individually. I’ll explain a little more deeply the structures of the course and what we learned below and at the very bottom you will also find a recipe that Nicky kindly shared with us in class and extend to all you readers now as well. It is a soup, as you know I love soup and this one is a keeper people! Leek, shiitake mushroom and brown rice (or barley). If you are interested in finding more recipes and reading more about the energetics of food you can find a bunch of good stuff here on Nicky Clinch’s website. Many of my new favourite recipes are tinkered together by Nicky and these polenta, pumpkin and white miso chips have become my main craving ever since we learned to make them in class! 1-2, Nicky Clinch. 3, Nicky’s brunch bowl. 4, Nicky Clinch. 5, Polenta and pumpkin croutons. Nicky Clinch trained as a macrobiotic chef and counsellor at The International School of Macrobiotics in Devon here in the UK. She has done further studies in London since at The Concorde Institute of Integral Studies, a place she returns to now and then. Her approach to food reaches deeper than beautiful plant based ingredients and cooking to the energies which they bring us. This is a corner stone of macrobiotics which I have found impacting the way I consider food since I joined Nicky’s course. Macrobiotics literally translated means ‘Big Life’ and this is the foundation inspiring the principles for living it encourages. The philosophy is based on eating foods which will bring balance to our lives starting with whole grains and adding vegan proteins, vegetables and sea vegetables as well as nuts, seeds and fruits. The idea is also a way of connecting with your environment and therefore eating what is available in your own surroundings, this has inspired me to go to my local farmers’ market and learning more about the seasons and eating according to them. At the root of these concepts and macrobiotics you will find Yin and Yang, which according to macrobiotics all of life is based upon. Yin brings opening properties whilst Yang offers a contracting energy. Each food we eat, and everything around us, contains these energies. Some more of one and some more of the other which offers our bodies and minds various stimuli. As I am still a baby in the understanding of these principles I don’t want to go too deeply into this subject here but there is lots of great reading to be done out there, of course you can find some good articles on Nicky’s site but I’m can also recommend ‘The Hip Chicks Guide to Macrobiotics’ by Jessica Porter which I’m reading at the moment. 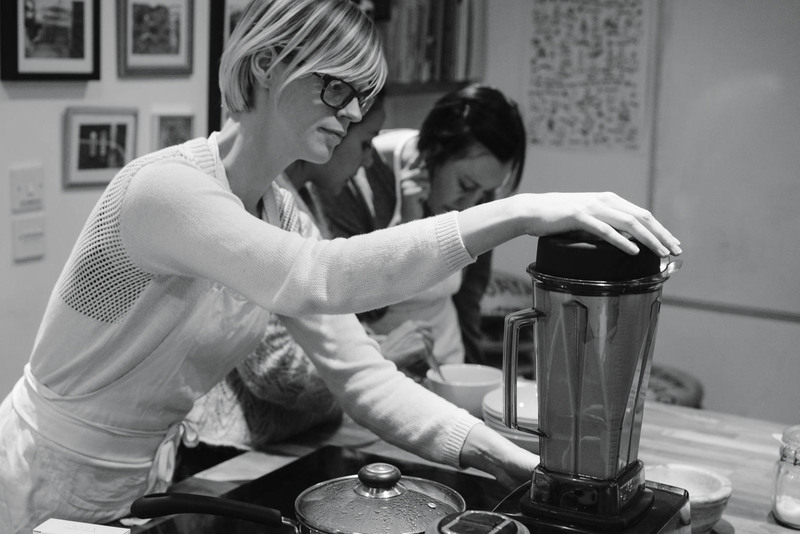 The course as a whole will bring light to the different foods included in a macrobiotic diet and Nicky explains each food groups properties in a comprehensive way teaching you how to incorporate them in a way which is beneficial to each individual. The individual is important to the way Nicky teaches and to macrobiotics itself as we are all different and will be needing different nourishment at different times. Therefore each class is started with a sharing of how the previous week has been and what sensations we’ve had in relation to our new knowledge. Depending on what reflections arise Nicky gives advice and ‘homework’ of small tasks that might help in getting through or figuring out whatever is craving attention. Cravings themselves are a big discussion point in the classes too as we all have them and society at large often encourage us to suppress them, often leading to the right opposite and an unhealthy relationship to food and eating. ‘Transform your diet, transform your life’ is great for understanding the cravings we have and learning how to feed them consciously and with care and love. Reflecting on our work over the past six weeks I do think this is the root to a healthy relationship to food and to myself. A craving for sugar might not be just that, there is often something more deeply rooted behind our cravings and if we listen well enough we can deal with this root rather than choking it down. I could speak about the benefits of doing this course for a couple of hours I think but I’m sure you now have an idea of what it’s all about on a philosophical level so I’d like to speak a little more in depth about the food below. But first some practical info about the course; their is one meeting each week over six weeks where different topics are being addressed. The course is set in the evening of a weekday making it easy to juggle alongside work. The meetings are held at Made in Hackney community kitchen which works well if your based in or around east London. 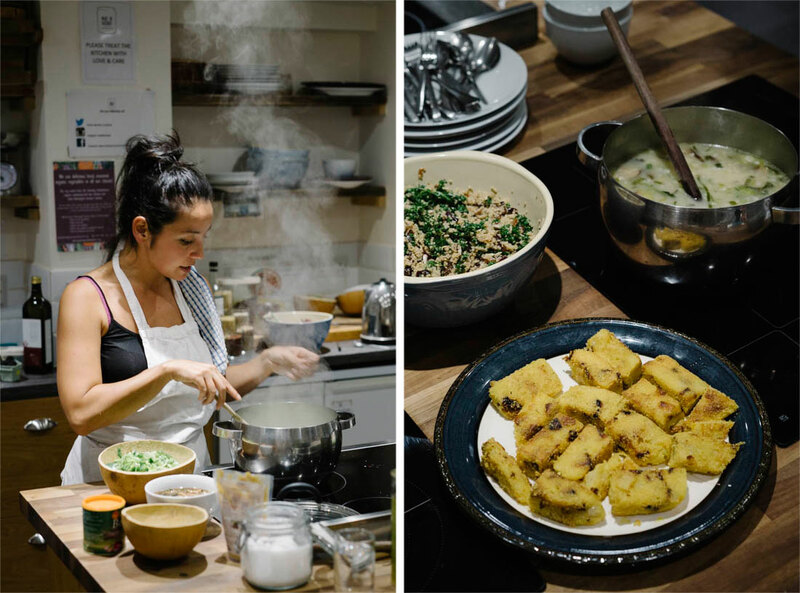 Cooking with Nicky Clinch at the Made in Hackney community kitchen. ‘Transform your diet, transform your life’ is a great course for laying foundations in your cooking and learning to cook from scratch. 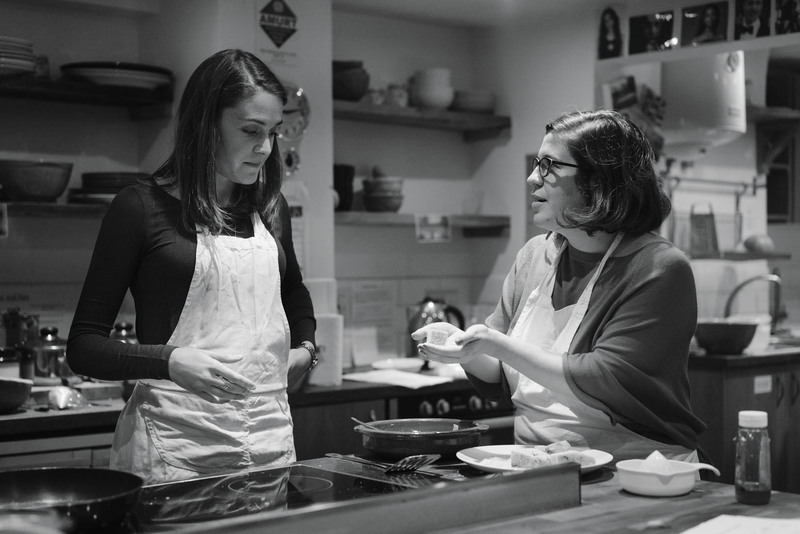 The focus being macrobiotics means that the food is cooked with great care to what goes into it and this is always a talking point during the class. It is a healthy approach without being at all depriving or restrictive. The course work is based on plant based whole foods making it available to everyone and Nicky was very sensitive to my gluten intolerance which made me feel welcome and at ease. Nicky mentioned a few times throughout the course that students often expect fireworks and fine dining cooking when first approaching the course but what it really offers is a solid knowledge base to stand on. Knowledge which will enable successful and nourishing home cooking for the rest of your life if you keep exploring and applying the skills learnt. I’ve already mentioned the ore philosophical work done in the course but understanding those aspects and applying them in everyday cooking makes all the difference and I find also brings a lot of creativity to the cooking Nicky offers on the course. In the first week we discussed foundations of macrobiotics and made stock from scratch and a nourishing soup based on that stock. A simple recipe kick starting our new way of cooking which was followed by an array of cooking techniques and recipes based on themes like; whole grains, vegan proteins, vegetables and sea vegetables, desserts and party foods. 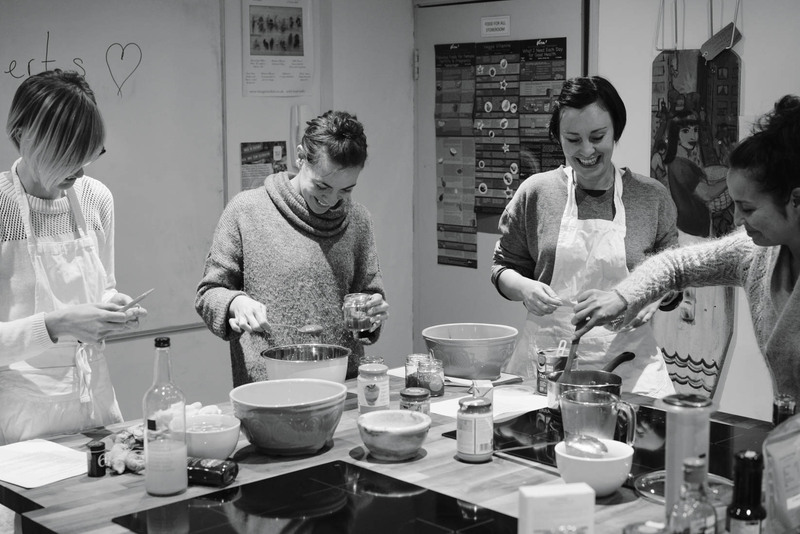 When we got towards the end and the desserts class I think we all embraced it wholeheartedly realising how amazing natural, seasonal and locally sourced foods really are paired with some cooking skills and creativity. Nicky mainly uses foods most of us have heard of and maybe even tried and the vegetables being local and seasonal were often familiar. It’s the way she uses them and brings them together to make delicious food that is at the core of this course. When using more rare foods, to us in the Western world, like seaweeds she will explain in detail their benefits and how to deal with them in a successful way. This opened up new doors for me and I find myself incorporating foods in my cooking I never paid attention to before. 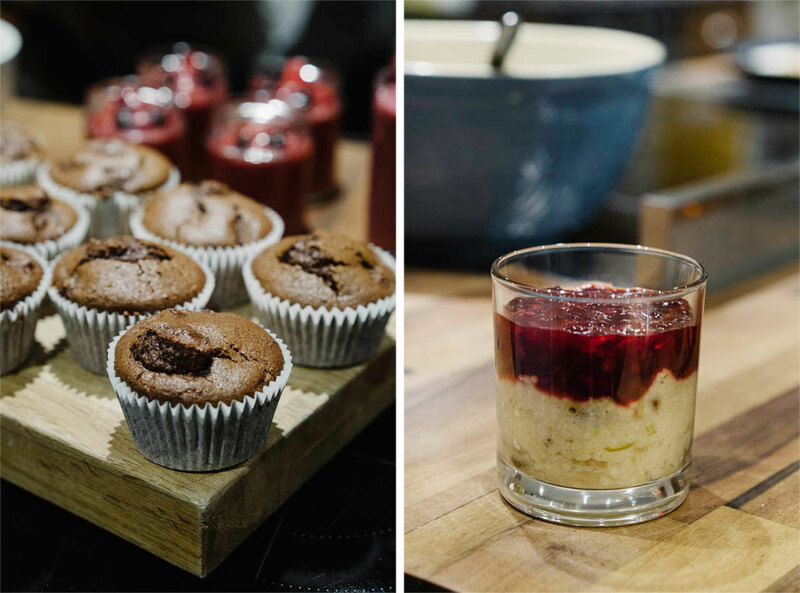 The classes are usually a feast for all the senses and at the end there’s a feast of lovely food to share with the other students, a beautiful way to round of an intense evening in the kitchen. 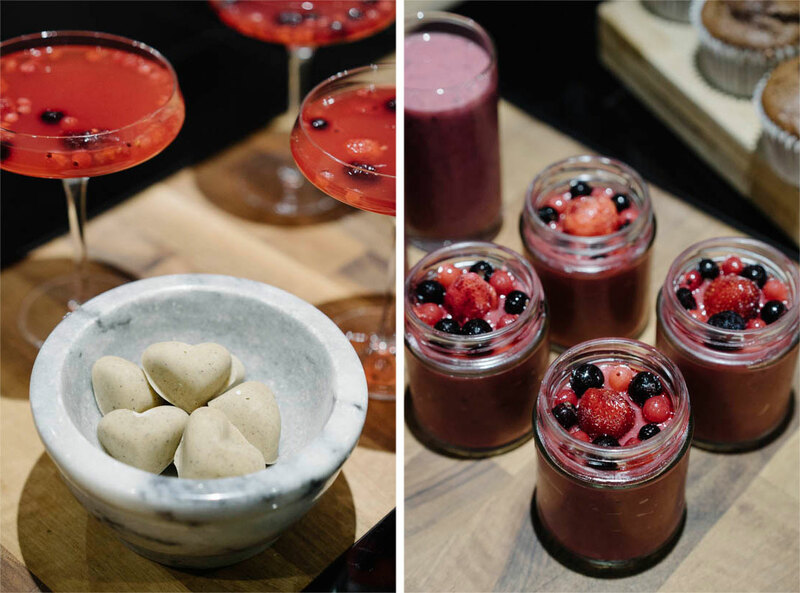 Enjoy dishes like buckwheat and sweet potato burgers, polenta, pumkin and miso chips, berry mousse and muffins cooked with love and enjoy the fact that they are nourishing your whole being. If you get the chance to attend this course I’d say you’re very lucky and in for a treat, to find out more about Nicky’s upcoming courses click here. 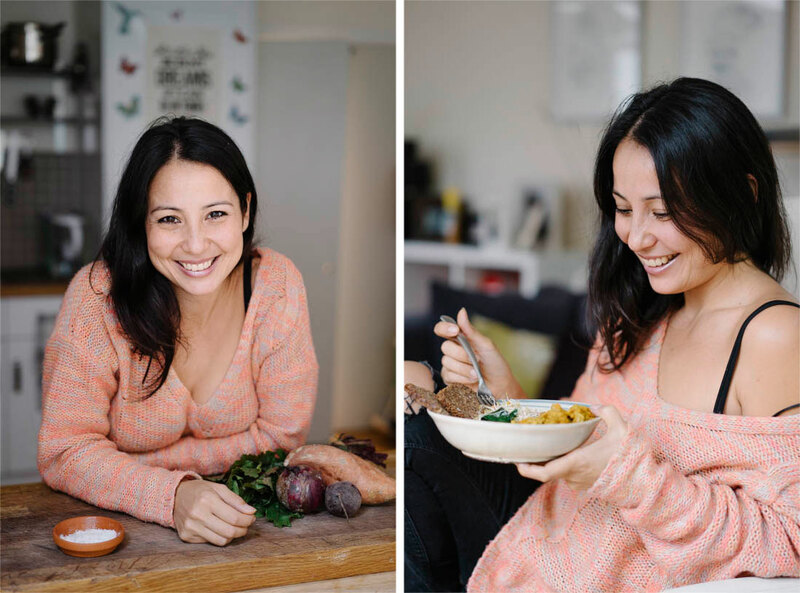 I know that she has a new “Transform your diet, transform your life’ coming up on the 5th of November with a couple of spaces left to fill so take this opportunity to dive straight in! 1, Chocolate and pear muffins. 2, Millet, ginger and lime pudding w. blackberry compote. 3, White cashew chocolate hearts. 4, Berry mousse. I wanted to share with you on a more personal level in this post because taking Nicky’s course didn’t just provide me with fantastic recipes I can cook up when I feel like it also affected me on a deeper level. Prior to starting the course I was feeling a little lost in life and was doubting myself a lot in almost everything I did. This was obviously not a very good place to be. I was starting to feel emotionally numb; as if I couldn’t really feel what I actually felt leading to much confusion as to what I want in life and how I I’m going to get there. I thought: ‘If I can’t even figure out what I want, how am I ever going to figure out how I can get there?’. I was getting into quite a negative thought spiral when I had my first class with Nicky and my lovely co-students. When I was asked to set an intention all I could wish for was to enjoy myself and not judge what I do. You see, when getting into a negative thought pattern nothing really feels much fun and it’s easy to compare yourself to others in a negative way when you don’t see the good things within you. I’m sure I’m not alone in feeling this from time to time and that’s why I thought it is important for me to share with you what really goes on underneath beautiful photos and delicious food. I started off there and as the weeks went on and we were asked to reflect on our relationships at large; to ourselves, people around us and to food I started being able to see things more clearly. I found patterns within my confused mind and was able to sort things out into more clear paths where I could actually verbalise what it is that I want and also what it is that I need. What I need from myself, from others and from food – to truly nourish myself in all aspects of life. Of course the path to the start of what I think of as a sort of self-enlightenment wasn’t all that smooth. At first I just went about making changes on a very basic level, like cutting out exotic fruits for example, just so try something new and to see where that took me. Then my reflections got deeper and I started really exploring what was underlying certain thoughts and cravings. Then one day I cried, something I used to do quite a lot but that seemed to have been blocked along with all the other emotional outlets. When that block popped open I also started laughing more and is crying felt good then laughing from the very bottom of my heart felt a thousand times better. I’m now at a place where I’m starting to feel with an open heart and I’m also starting to be able to express what was hidden within it; my dreams, hopes, wants and needs. The course provided me with an opening and a new beginning, through the energy of food as well as the energy and power of reflection and sharing. Me sharing my journey during these weeks will of course not guarantee that you will have some sort of major life changing experience during Nicky’s course but I think that if you were open to it and really follow her advice you can. I’d also like to add that just before I started taking Nicky’s classes I took up exercise, something I hadn’t done in a long time. I mainly did yoga during the course, both dynamic (yang) and restorative (yin), which I think aided me in my process of opening up to living. With that said, thank you very much for reading this monster of a post! I really hope you enjoyed reading it and are a bit more interested in finding out more about Nicky and her course. I also hope that you enjoyed the more personal touch to it, please let me know if you’d like more of that! Now scroll a little further to find one of Nicky’s delicious recipes! 1, Margherita pizzas. 2, Brown rice sushi rolls. This soup is one of my all time favourites. Energetically it is particularly great for unlocking blocked or stuck Liver energy which is the energy that allows us to express ourselves more clearly, openly and directly. It is the house of our creative inspiration and when flowing smoothly allows us to see clearly new possibilities and come up with great new creative ideas and ventures. Unfortunately though if we are not fully expressing ourselves, holding in emotions, not using our authentic voice, carrying unexpressed anger as well as eating heavily salty, oily, sugary and fatty foods and animal based foods, it can get very blocked. Leading us to feel stuck in our lives and ourselves, as well as feeling of angry and frustrated. 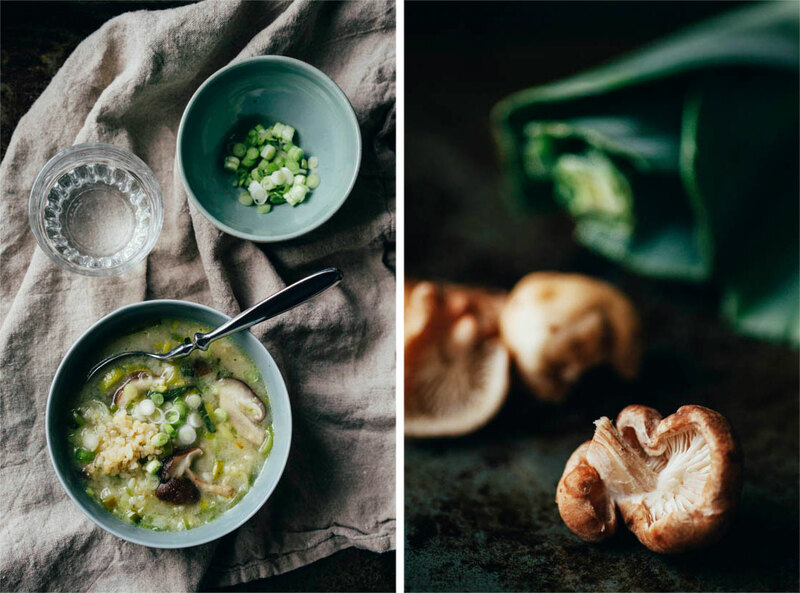 This soup is light, opening and delicious and has an amazing emotionally calming feel to it – whenever I eat it I feel instantly soothed, calm and nourished. Soak your grain over night or for at least 2-3 hours. Cook the barley or brown rice with 1 1/2 cups water and a strip of kombu seaweed. Cover with a lid and simply bring it to a boil and then turn down to a simmer until all the water has been retained by the grain. You could also use leftover barley/rice in which case you just leave this step out of course. 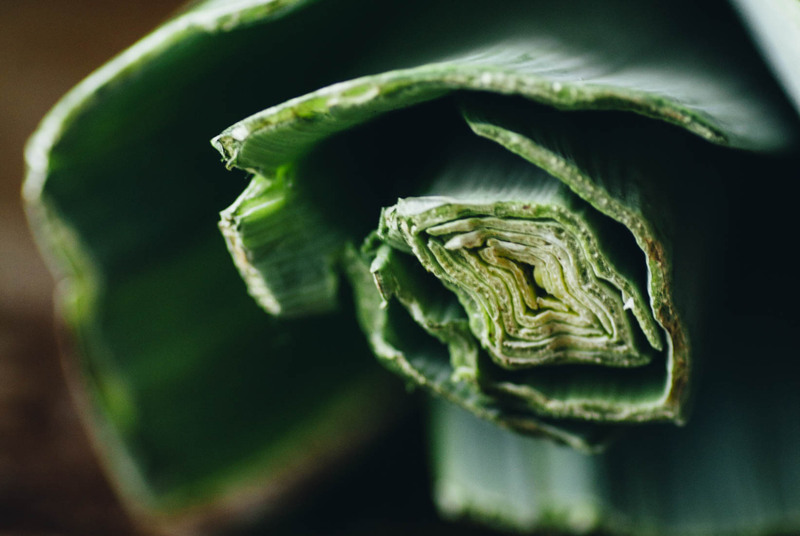 Thinly slice the leeks all the way to the top and fry them in sesame oil on a low/medium heat for a minute. Add a pinch of salt, mix and cover with a lid and let the leeks sweat until soft and the white parts are translucent. Add vegetable stock or water and boullion powder as well as sliced shiitake mushrooms and bring to a boil. Add the rice and turn heat down to a medium simmer and leave the soup to cook for 15-20 min or until the mushrooms are soft. Take off the heat and add salt and white miso paste until the soup has your preferred flavour. Really interesting blog that I am glad you wrote! As a result I’ve followed Nicky on Instagram, bought a book on macrobiotics and am going to try the soup recipe today! Very insightful to hear about your journey and it affirms many of my current thoughts around food. Thank you very much. thank you very much for sharing your thoughts with me! Thank you, I’m glad to hear that you enjoyed it and many thanks for reading! Just made this soup after a long day at work (tree-top ropes course instructor). Tastes great. My first macrobiotic meal. I’ve been vegetarian for a couple of years and vegan for about 7months now. Never tried miso before. Tastes great. Thanks for sharing. Also really liked what you had to say about the liver and living authentically. I’m glad to hear that you enjoyed Nicky’s soup, it has done wonders for me and is steadily on repeat in my kitchen. Congrats on your first 7 months as vegan! I hope it feels as good for you to have made the transition that it does for me. And miso, it is such a delicious flavour I think so I’m glad you finally tried it and enjoyed it. As I’m not necessarily a trained macrobiotic cook, I’ve simply done this short course and am still learning about the science, I couldn’t provide the same insight as Nicky. In terms of breakfast to switch things up and feel better from what you eat I would evaluate why you don’t feel so good from the breakfast you eat now. What about oats makes you not feel your best? That way you can figure out what you could eat instead that might be better suited to your needs. I think that you could eat anything for breakfast really as long as it makes you feel good but with the limited time we usually have in te morning it’s probably not time to cook up a storm. Therefore if I feel like eating something more elaborate I like to prepare the evening before, like with your soaked oats. Some things I enjoy that are different from oats are having soup for breakfast. Sometimes when I make soup for dinner I eat the same thing for breakfast. Another thing is tofu scramble which you could crumble up and mix with your seasonings the night before and simply heat in a skillet with whatever other ingredients you want to add to it. Smoothies and juices add a sometimes much needed freshness to my mornings with good amounts of vegetables and some fruit. If you’ve got a good blender you could try adding carrots and beetroot for example to your smoothies instead of everyone’s regular green smoothies, although those are great too but focus on the green part and add just a little fruit for sweetness. You could also make porridge from other grains like quinoa, millet or teff which will give you something different from oats energetically. Okay I’ve now written a novel, haha! I hope you get to read this and find it useful. I did find this very useful, I have continued on the food journey and experimented with fruit cleanses/water fasting in the summer and eat a high raw plant based diet. During the fruit cleanse I had a very intense healing reaction. I quit my job and spent a month on my own by the sea eating just organic fruit. A huge amount of mucus loosened came off my chest (probably from past drug use). Now when I jog, my lungs are the last to get tired, even after running 10k I am never gasping for breath! I’m back on this page because I’m making this delicious recipe again. Last month I went to the UK medicinal mushroom conference. It is truly amazing how healing and immune boosting mushrooms are!!! Im now studying a 4 year master medical herbalism course in Ireland, which is based on a vegan, 80% raw ethos! I’m glad to hear that you’ve found a way that works for you! Wishing you all the best and thank you for sharing with me.